Mascarpone cheese and lemon curd create a zippy filling, while powdered sugar provides a snow-dusted look. These sandwich cookies will be the star of any holiday party! In a large mixing bowl beat butter and shortening with an electric mixer on medium to high speed for 30 seconds. Add granulated sugar, lemon peel, baking powder, baking soda, and salt. Beat until combined, scraping sides of bowl occasionally. Beat in sour cream, egg, and vanilla until combined. Beat in as much of the flour as you can with the mixer. Stir in any remaining flour. Divide dough in half. Cover and chill dough about 2 hours or until easy to handle. On a floured surface roll half the dough at a time to 1/8-inch thickness. Using a 2 1/2 to 3-inch star-shape cookie cutter, cut out dough. 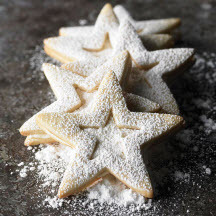 Using a 1-inch star-shape cookie cutter, cut a star from the center of half of the cookies. Place cookies 1 inch apart on ungreased cookie sheets. Bake for 7 to 8 minutes or until edges are firm and bottoms are very light brown. Cool on cookie sheets for 1 minute. Transfer to a wire rack and let cool. Just before serving, spread about 1 teaspoon of the Creamy Lemon Filling over the flat sides (bottoms) of the cookies with no cut-out centers. Generously sprinkle the tops of cookies with the cut-out centers with powdered sugar and press the flat sides against the cookies with the filling. For Creamy Lemon Filling: In a small mixing bowl beat mascarpone cheese and butter with an electric mixer on medium to high speed for 30 seconds. Beat in lemon curd until combined. Gradually add powdered sugar, beating on medium speed until smooth and creamy. Store in refrigerator until needed. Makes about 80 cookies or about 40 sandwich cookies. Make-Ahead Directions: Layer unfilled cookies between sheets of waxed paper in an airtight container; cover. Store at room temperature for up to 3 days or freeze for up to 3 months. Nutritional Information Per Serving (1/40 of recipe; 1 sandwich cookie): 129 kcal cal., 7g fat (3g sat. fat,1g polyunsaturated fat, 2g monounsatured fat), 17mg chol., 47mg sodium, 16g carb., 0g fiber, 10g sugar, 2g protein.